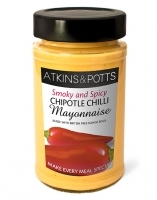 Atkins and Potts classic mayonnaise with a good measure of chipotle chilli to create a spicy smoky accompaniment for cold meats, sausages and salads. Use as a dip for corn chips, fries or crudités, or reduced with a little more vinegar as a dressing. 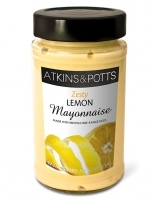 Atkins and Potts classic mayonnaise with a twist of refreshing lemon zest, juice and oil. 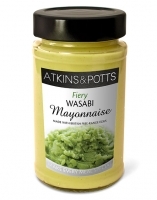 A perfect partner for barbecued prawns, grilled fish or chicken, or to make a tangy coleslaw. 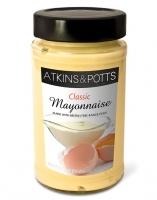 Atkins and Potts mayonnaise is made with the classic ingredients of free-range egg yolk, Dijon mustard, lemon juice and white wine vinegar. 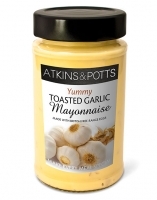 Perfect in a sandwich, wrap or salad, and for countless other meal occasions.